US military vehicles in Syria. President Donald Trump’s announcement last month that he had decided to withdraw the 2,000 U.S. troops there stunned allies who have joined Washington in the battle against Islamic State militants in Syria. Senior U.S. officials were shocked too, among them Defense Secretary Jim Mattis, who quit in protest. After media reports suggesting the departure of U.S. forces had begun, the Pentagon later said no troops had yet withdrawn and stressed that the battle against Islamic State was continuing as U.S.-backed forces try to capture the group’s last remaining pockets of territory in Syria. “We will confirm that there has been no redeployment of military personnel from Syria to date,” said Navy Commander Sean Robertson, a Pentagon spokesman. 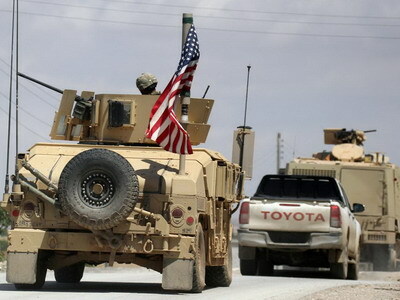 U.S. officials, speaking on condition of anonymity, confirmed that equipment was being moved out of Syria, a sign that despite mixed messages from Washington preparations for a withdrawal of troops was proceeding apace. Robertson, in his statement, said the coalition had carried out “logistical measures” to support a withdrawal but did not enter into details. “The withdrawal is based on operational conditions on the ground, including conversation with our allies and partners, and is not be subject to an arbitrary timeline,” he said. “The results of the aggression so far were limited to a strike on one of the warehouses at Damascus airport,” SANA quoted a military source as saying. The U.S. decision has injected new uncertainty into the eight-year-long Syrian war and spurred a flurry of contacts over how a resulting security vacuum will be filled across a swathe of northern and eastern Syria where the U.S. forces are stationed. U.S. national security adviser John Bolton suggested on Tuesday that protecting Washington’s Kurdish allies would be a precondition of the U.S. withdrawal. That drew a rebuke from Turkish President Tayyip Erdogan who called his comments “a serious mistake”. Turkey views the U.S.-backed YPG Syrian Kurdish militia as an extension of the Kurdistan Workers’Party (PKK), which has waged a 34-year insurgency in Turkey for Kurdish political and cultural rights, mostly in southeastern areas near Syria.